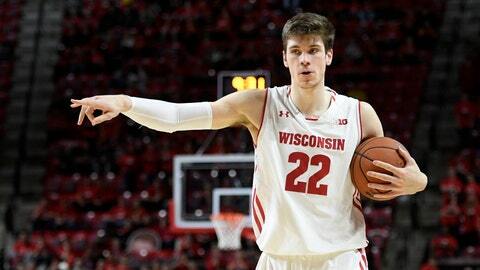 MADISON, Wis. — Every so often, Wisconsin’s Ethan Happ makes a move around the bucket that reminds some college basketball experts of an NBA Hall of Fame forward. It’s more about how Happ freed himself to get to the hoop for the 25th-ranked Badgers than the shot itself. Check out the footwork. It reminded ESPN analyst and former Duke center Jay Bilas , among others recently on Twitter, of former Boston Celtics great Kevin McHale. Assistant coach Howard Moore can’t help but agree. While Happ might have not have McHale’s shooting touch, Wisconsin’s 6-foot-10 senior is just about as good as anyone in the college game in the lane. “But as far as the footwork and the knack of understanding angles and ways to get to the rim, without having … to just leap over everyone and finish, I think is pretty remarkable to see how comparable they are,” Moore said. Happ is off to another strong start, averaging 18.3 points, 12.0 rebounds and 7.7 assists for Wisconsin (3-0). The preseason All-American is the nation’s only player averaging even 18 points, 10 rebounds and six assists. He was clutch in the Badgers’ biggest game so far, getting 30 points and 13 rebounds last week at Xavier, a win that helped propel back into the AP Top 25 on Monday for the first time since the final poll of the 2016-17 season. The competition ramps up this week at the Battle 4 Atlantis tournament in the Bahamas. The Badgers open against Stanford on Wednesday, and could face either Florida or Oklahoma on Thanksgiving Day. Happ might be the ideal role model for consistency. A four-year starter, Happ is already Wisconsin’s career rebounding leader . He’s also seventh in points, 12th in assists, sixth in blocks and third in steals. “He is a unique type player. He doesn’t shoot from the perimeter at all, but yet he just tears you up inside,” Houston Baptist coach Ron Cottrell said. Happ did take part in NBA draft workouts in the offseason, using that time in part as a learning experience. He figured to return to school as long as he wasn’t forecast to be a potential first-rounder. Happ could improve his game by being able to hit mid-range jumpers consistently and getting better from the foul line. A career 56 percent free-throw shooter, Happ is 5 of 11 (45 percent) so far this season. In the paint with the ball, though, Happ has few peers. “The footwork of Wisconsin’s Ethan Happ is impeccable. McHale-esque, without the McHale shooting touch. Impressive,” Bilas said in his tweet about Happ’s performance against Xavier. It’s not the first time that Happ has heard that comparison, either. But while he’s watched highlights of McHale, Happ doesn’t necessarily model his game after the former Celtics star , or any one big man for that matter. Like a good student of the game, Happ has also learned moves from both former teammates and opponents, like former Michigan State forward Matt Costello. “I watch a lot of Michael Jordan highlights,” Happ said, “but I wouldn’t say I model my game after him.